Pulitzer Prize-winning film critic Roger Ebert isn't a movie star but he critiques them on TV — so memorably that he received his own star on the Hollywood Walk of Fame. A crowd of family, friends and fans cheered as Ebert's star was unveiled Thursday in front of Hollywood's El Capitan Theatre. Attendees included director Werner Herzog, actress Virginia Madsen and actor Tony Danza. 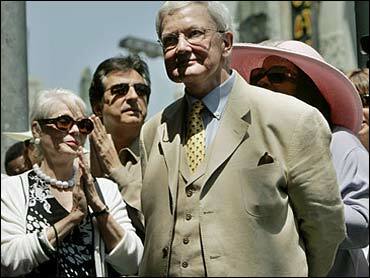 "When I watch movies, I can feel what it's like to walk in another person's shoes," Ebert, 65, told the crowd. "Movies make us more decent people. This is a wonderful day for me." Ebert, who began his journalism career as a 15-year-old sports writer for The (Champaign, Illinois) News-Gazette, was named the Chicago Sun-Times film critic six months after joining the paper in 1966. In 1975, he became the first film critic to receive a Pulitzer for arts criticism. That same year Ebert teamed with the late Chicago Tribune film critic Gene Siskel on the TV show "Sneak Previews," which would evolve into the long-running "Siskel & Ebert and the Movies." Their "thumbs up, thumbs down" system of rating films became so popular that Ebert eventually trademarked his right thumb. Ebert now co-hosts "Ebert & Roeper" with fellow Sun-Times columnist Richard Roeper. A humorously unapologetic critic who once called a film "an assault on the eyes, the ears, the brain," Ebert has written 17 books, including "Roger Ebert's Book of Film" and "I Hated, Hated, HATED This Movie." He has also dabbled as a screenwriter, with credits including "Beyond the Valley of the Dolls" and "Beneath the Valley of the Ultra-Vixens."